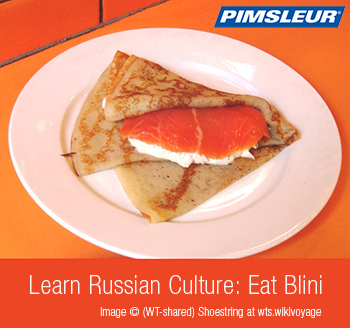 How to Speak Russian: Eat Blini. If you want to know how to speak Russian, an important word to learn is blini. “Blini” are delicious Russian-style pancakes eaten with a variety of toppings—the most common are sour cream, caviar, butter, and jam (but not all at the same time). The streets in Moscow and other Russian cities are always full of vendors selling blini. They make a great late night snack or street food for walking around, since they can be rolled up into a tube. It is also fairly easy to prepare them yourself at home—not much different from pancakes, with a few tweaks. The batter includes eggs, milk or heavy cream, sugar, salt, and flour. They are cooked similarly to crepes, by pouring the batter into a pan and then tilting it to form a thin layer over the entire surface. Different varieties can be thicker or thinner, wrapped around fillings or dipped in sauces. One of my favorite fillings is a very Russian combination of mashed potatoes, dill, and mushrooms. There are many English language recipes available on the Internet, but to learn how to speak Russian, it is great practice to try following an authentic Russian recipe in Russian. Blini are so central to the Russian tradition that there is an entire week-long holiday centered around them. In Russian, it’s called Maslenitsa, from maslo, the word for butter. In English it can be called Butter Week, Blini Week, or Pancake Week. This holiday happens the week before Orthodox Lent and is one of the cheeriest and also strangest of Russian holidays. The general concept is similar to Mardi Gras, in that it is a week of revelry that precedes the more somber Lenten season. But Maslenitsa is much more rooted in religion than Mardi Gras, and instead of throwing beads and eating king cake, the Russians throw snowballs and eat pancakes. Everyone is happy because Maslenitsa signifies the beginning of spring. The sun starts to come out, the snow starts to melt, and the seemingly endless winter is over. The central focus of the festivities is the consumption of blini slathered in butter, as their round shape represents the sun and their dairy-heavy ingredient list represents basically every food forbidden during Lent. The Maslenitsa holiday marks the beginning of Lent and serves as a last chance to indulge in rich food, dairy products, and general merrymaking. Thousands and thousands of blini are prepared, and given to friends, family, and really anyone who wants them. There are also some very unique traditions associated with the festival—including fistfights! Yes, fistfights. The reasoning behind holding scheduled, public fistfights during Maslenitsa is to celebrate Russia’s fighting spirit. Another feature of the festival is Lady Maslenitsa, a huge straw figure of a woman dressed in bright clothing. She goes up at the beginning of the week, and on the last day, is burned to signify the end of winter. There are also sleigh rides, snowball fights, elaborate visits to extended family, and an entire day dedicated to begging forgiveness of everyone around you. These festivities are fantastic for visitors or tourists, but if you know how to speak Russian —even just a little— the experience becomes wonderfully immersive. Even if you don’t know how to speak Russian, you can bring some of the spirit to your own home by cooking blini and sharing them with your loved ones. Maslenitsa begun on February 24th this year, so start baking! This entry was posted in Travel and tagged blini recipe, how to speak russian, Maslenitsa, russian culture, russian festivals, russian language on February 26, 2014 by Mariah Astulfi.